ICE problems have led to a revival of loco hauled expresses on the Gäubahn. Instead of the dreaded white worms, class 120s now haul rakes of proper coaches on Zürich - Stuttgart InterCity services. 120102 approached Rottweil with IC184, the 15:10 Zürich HB - Stuttgart Hbf on 17 April 2010. 120113 accelerated IC281, the 15:55 Stuttgart Hbf - Zürich HB, away from Rottweil on 17 April 2010. The line in the foreground is the route to Villingen. 120113 sped IC183, the 09:55 Stuttgart Hbf - Zürich HB, past Grünholz loop on 18 April 2010. Grünholz means green wood but the trees had barely started to turn green by mid April. I was more than happy photographing 120s but to get a class 110, and one of the 50 year old originals as well, was the icing on the cake. 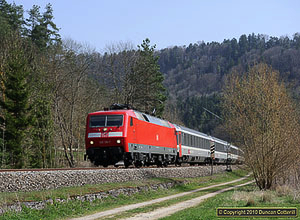 110210 led IC282 north past Oberndorf-Aistaig on 18 April 2010. 425305 worked RE19635, the 09:18 Stuttgart Hbf - Rottweil, towards Oberndorf on 18 April 2010. 120136 emerged from the forest near Oberndorf-Aistaig with IC183, the 09:55 Stuttgart Hbf - Zürich HB, on 19 April 2010. 111035 hauled RB30290, the 16:25 München Hbf - Treuchtlingen, along Altmühltal towards Dollnstein on 19 April 2010. Trainloads of new cars form a significant proportion of the freight traffic through Altmühltal. 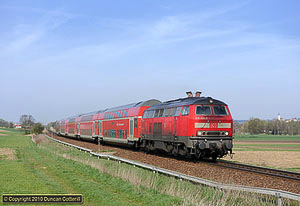 152156 headed for Ingolstadt with a train of cars on the big curve at Breitenfurt, east of Dollnstein, on 21 April 2010. 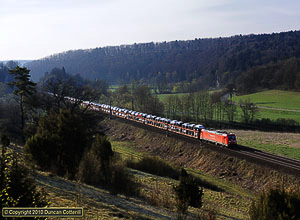 185235 emerged from the Esslingerberg Tunnel and crossed the Altmühl with a westbound train of cars on 20 April 2010. 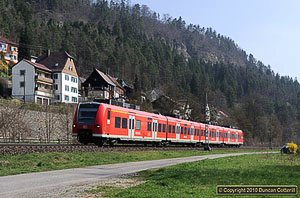 Crossrail 185597 left the village of Solnhofen behind as it wound its way down Altmühltal with another train of cars on 21 April 2010. Apart from the railway, Solnhofen is famous for its fossils of Archaeopteryx, the earliest bird. 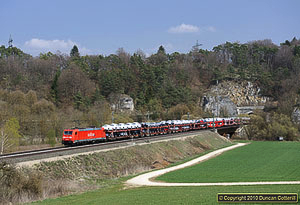 Yet another train of cars was photographed at Hagenacker, near Dollnstein, on 22 April 2010. 185298 was heading west in glorious early morning light. 111226 hauled RE35925, the 07:38 Nürnberg Hbf - München Hbf away from Dollnstein at Breitenfurt on 22 April 2010. The push-pull sets used on the line appear to face either way at random, making it difficult to predict which trains are worth photographing and where to stand. 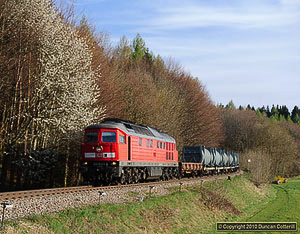 233043 was photographed on an empty binliner, passing a tree in blossom near Boslhäusl, north of Kastl, on 22 April 2010. Local passenger services around Mühldorf are operated by Südostbayernbahn, a DB subsidiary, and include class 218 worked push-pull sets on the München - Mühldorf route. 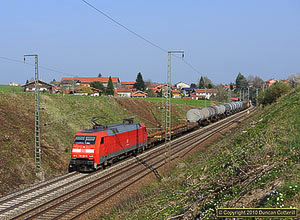 218426 was photographed east of Dorfen Bahnhof with train RB27031 on 23 April 2010. 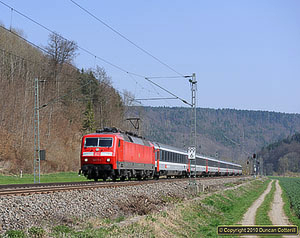 218428 accelerated away from Eggenfelden Mitte with RE27005 on 24 April 2010. This train conveys through coaches from München to Hamburg via Mühldorf and Passau and runs on Saturdays only. 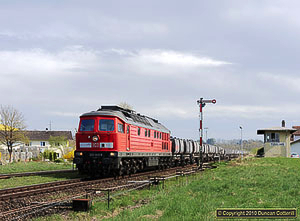 233043 passed Tüssling with a train of tubs from the Calcium Carbide plant at Hart an der Alz, near Garching, on 26 April 2010. Undoubtedly the best looking engine at Mühldorf is 217002 in an attractive maroon and cream livery reminiscent of that carried by the class 103 electrics. 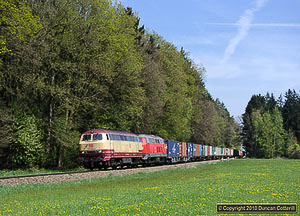 On 28 April, 217002 and 225806 approached Pirach with container train 50536 from Wackerwerk to Hamburg. The incinerator at Gendorf, near Kastl, receives a steady supply of domestic rubbish by rail. 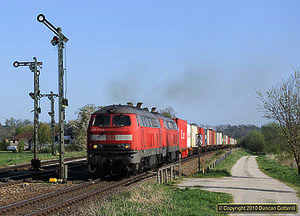 217019 and 217021 approached Tüssling with a loaded train on 28 April 2010. A number of freight trains were diverted via Mühldorf during engineering work on the München - Salzburg line west of Traunstein. 225071 and 225073 passed the semaphores at the north end of Tüssling on 28 April 2010. 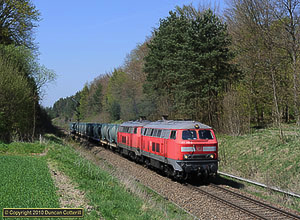 233596 pulled away from Tüssling with a train of gas tanks after a brief stop on 28 April 2010. 101043 led EC317, the 05:32 Saarbrücken - Graz, east from Traunstein on 24 April 2010. Internal Austrian services between Wien and Innsbruck or Bregenz travel through German territory from Salzburg to Kufstein. 1016.025 passed Burghartsöd, east of Traunstein, with EC742, the 09:44 Wien Westbf to Innsbruck, on 24 April 2010. 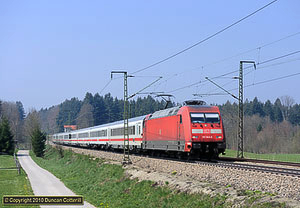 Local passenger services between München and Salzburg are worked by class 111 locos on push-pull sets. 111020 passed Burghartsöd, east of Traunstein, with RE30015, the 11:42 from München. 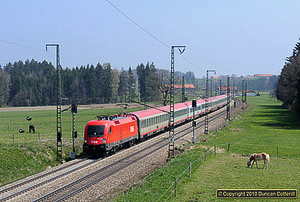 1116.202 led RJ64, the 11:10 Budapest to München, through the cutting at Lauter, east of Traunstein, on 24 April 2010. 152160 worked a westbound freight through the cutting at Lauter on 24 April 2010. Most of my April 2010 trip to Europe was spent in Germany visiting a number of interesting lines in the south of the country. 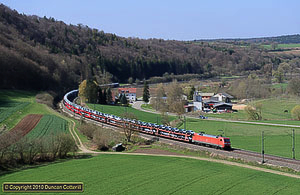 The electrified Gäubahn from Stuttgart to Singen runs down the Neckar Valley on the eastern side of the Black Forest and has recently seen a resurgence of loco hauled international passenger trains. Further east, the electrified line through Altmühltal carries heavy freight traffic from the München area to northern and western parts of Germany. 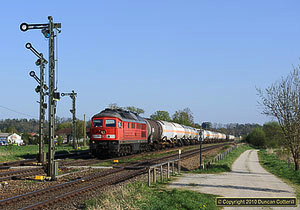 The line from Mühldorf to Burghausen also carries heavy freight traffic, mainly serving local chemical plants, but is diesel worked. This report is divided into two parts: This page contains a summary of the trip. The Day by Day section contains details of each day’s activities, trains seen, travel, hotels etc. The area south of Stuttgart is known as the Gäu and gave its name to the Gäubahn, although Neckartalbahn would be just as appropriate as the line follows the valley of the River Neckar for many kilometers after leaving the Gäu. The Gäubahn links Stuttgart with Singen and forms part of the international route linking Stuttgart with Zürich. Although the line appears to have been double track in the past, it is now single track south of Horb and electrified. Many of the intermediate stations have been closed, leaving only two, Sulz am Neckar and Oberndorf am Neckar, open on the 43km stretch between Horb and Rottweil. Fortunately, the passing loops at most former stations have been retained, allowing traffic to flow freely. I spent two days on the line, from midday on Saturday 17 April to mid morning on Monday 19 April. 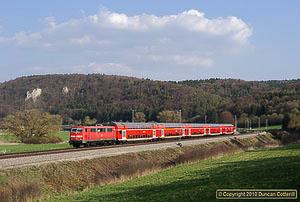 International IC trains run between Stuttgart and Singen and v.v. every two hours, en-route to/from Zürich. Virtually all these trains were booked for tilting ICEs until recently but serious problems with the units have caused a return to loco haulage. Most trains are now hauled by class 120s but class 110s also appear from time to time. There are also RE trains from Stuttgart every hour with alternate trains terminating at Rottweil or running through to Singen. The Rottweil services are operated by class 425 EMUs while the Singen trains were all worked by class 146 locos at the north end of double-deck push-pull sets on the Saturday and Sunday. On the Monday morning, train RE19610 was worked by a pair of class 425s instead of the expected class 146. There are additional trains north of Eutingen and south of Rottweil but these weren’t seen. A number of freights run over the Gäubahn and every train seen (4 on Saturday and 1 on Monday) was worked by class 185s, one with two locos at the front and one in the rear. For most of the route along the Neckar Valley, the line runs in close parallel to a good main road. This is both a blessing and a curse as it allows easy access to the line but it can be very difficult to keep the road and its traffic out of the pictures. There are a number of good photo locations along the Neckar Valley, although nothing exceptional, and the twists and turns of the valley ensure that the light is always good somewhere on the line. Although most of my time was spent in the Neckar Valley, I did venture further south to a pleasant spot on the southern outskirts of Rottweil and further north to find some good shots close to Eutingen. As stated above, road access to the line is very good and the distances between the stations make access on foot to most locations impractical. The area is well provided with good cycle paths, like so many places in Germany, and linesiding by pushbike would be a possibility for the fittest. The double-track, electrified line from Ingolstadt to Treuchtlingen drops into the Altmühl Valley (Altmühltal) near Eichstätt and follows the river as it twists its way westwards through glorious scenery to Treuchtlingen. This used to be one of the main passenger routes out of München towards the north and west but long distance traffic has been diverted progressively to upgraded routes that offer faster journey times or serve larger population centres. Today, the line through Altmühltal is primarily a freight route with an hourly local passenger service. I spent almost three days on the line, from mid afternoon on Monday 19 April to late morning on Thursday 22 April. The local passenger service is hourly and operated by class 111 locomotives on double-deck push-pull sets. Unusually for Germany, there is no consistency in which way round the sets run and any train could appear with the loco at either end. München - Ingolstadt - Treuchtlingen trains alternate with München - Ingolstadt - Treuchtlingen - Nürnberg services during the week. At weekends many more trains continue beyond Treuchtlingen to Nürnberg. Long distance trains are not unknown but you have to be lucky to see any. On Tuesday 20 April, two ICEs were seen in the valley. This was during the Great Volcanic Ash Scare and the trains were presumably relief services to cope with the flood of grounded fliers turning to the railways to reach their destinations. On Wednesday 21 April, CNL483 was running late and was seen heading eastwards in the early morning behind a class 101. I’d expected to see quite a lot of freight but the actual volume exceeded my expectations. On Tuesday 20 April, 38 freights were seen in just over 11 hours and a similar period on Wednesday 21 April produced no less than 49 freights, an average of more than two each way every hour. The vast majority of trains were worked by DBS locos, principally of classes 152 and 185, however, 151s were also fairly common and there were a few 189s, the occasional 140, 155 or 182 and even departmental 114501 on a string of track machines. There were also a number of trains hauled by the locos of other railways and independent operators but not as many as I would have expected. SBB Cargo class 482s would appear a few times each day on trains of oil tanks but otherwise there was little consistency and most operators were represented by a single loco seen at some time over the three days I was there. Almost all the locos were of classes 182.5 or 185.5 with SVG 1142.579 being the only real surprise. I’d decided to go to Altmühltal on the basis of a journey through the area in 2007. Although the line was overgrown for much of its length, it was very scenic and there did appear to be a few clear spots along the route. DB have been rather busy since then, sweeping away the old semaphore signals and refurbishing the stations. More importantly for photography, they’ve cleared the lineside vegetation from long stretches of the line, opening up many more photo positions. The result is one of the best areas I’ve found for photography in a long time. It’s got the same high traffic levels and variety of motive power as Gemünden or Bad Hersfeld but with more and better photo locations. This is an area that could be successfully be covered by train and on foot. All of the locations I visited were within 4km of Dollnstein, Solnhofen or Pappenheim stations. Although having a car was useful for some positions, most of those between Solnhofen and Dollnstein involved parking up and walking along the inevitable cycle path to gain access to the spots. I’d spent a few days around Mühldorf in May 2009 but the weather had been poor and I’d only got a handful of reasonable shots. Mühldorf lies east of München, at the centre of a network of diesel worked lines stretching west to München, east to Simbach and Burghausen on the Austrian border, north to Landshut and Passau and south to Rosenheim, Traunstein and Freilassing. Some of the lines carry a high volume of freight traffic, making them very unusual in today’s Germany, where most freight is concentrated on electrified lines. The area south and east of Mühldorf is known as the Chemical Triangle due to the large petrochemical plants at Wackerwerk (nr Burghausen), Gendorf (nr Kastl) and Hart an der Alz (nr Garching) that generate most of the area’s freight traffic. Despite all the industry, the lines run through a pleasant mixture of rolling farmland, woodland and delightful villages. The semaphore signals that survive at many stations add considerably to the interest. I was in the Mühldorf area for just over six days, from mid afternoon on Thursday 22 April to early evening on Wednesday 28 April, but spent most of the Saturday and all of the Sunday on electrified lines further south and east. There are plans for modernisation in the Mühldorf area. An article in the Süddeutsche Zeitung talked about double tracking from München to Mühldorf and on to Freilassing to provide an alternative route from München to Salzburg. Apparently this has been on the cards for some time but little has happened to date. There is currently modernisation work on the Burghausen branch with Altötting station currently being rebuilt and apparently about to lose its semaphore signals. Elsewhere on the branch, new communications cables are being laid and, nearer to Mühldorf, a new bridge wide enough for double track, is being built across the river Inn. Most passenger services around Mühldorf are worked by class 628 2-car DMUs but there are some notable exceptions. 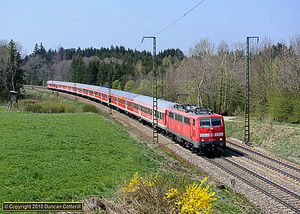 Many of the hourly trains on the line to München are formed of double-deck, push-pull sets powered by class 218 locomotives at the Mühldorf end of the formation. Some rush hour trains are hauled or worked top’n’tail and a couple of these run through to/from Simbach. There’s also a through train between Linz and München via Simbach every day, worked by an ÖBB class 2016. There are some DMUs on the München line at quieter times of the day and the Sunday morning service is almost entirely unit operated. Away from the east-west axis, loco worked passengers are few and far between. On weekdays there’s a turn for a class 218 worked push-pull set from Mühldorf to Landshut and Salzburg on trains 27204, 27085, 27086 and 27211. The only other loco hauled trains are Saturday’s 27005 from Mühldorf to Passau and 27004 in the other direction. These trains are formed of InterCity stock and worked by a class 218 diesel. From Passau the coaches of 27005 go forward to Hamburg on IC1886. 27004 is formed of coaches off IC1887 from Hamburg. The line from Mühldorf to Burghausen serves the petrochemical plants at Gendorf and Wackerwerk and sees the heaviest freight traffic in the area. As well as trains of oil and gas tanks, there are block container trains, plenty of general freight and trainloads of rubbish to the incinerator at Gendorf. From Mühldorf the container trains run to Landshut but most of the other traffic goes via München with a lot of trains running at night. The rubbish traffic comes from all over the area with one notable train running to/from Wiederting, near Traunstein, via Freilassing. There is currently engineering work between Rosenheim and Traunstein and some freight traffic is running directly from Mühldorf to Freilassing to bypass the affected section. Most trains are worked by class 217 or class 225 diesel hydraulics running in pairs with both classes being used interchangeably and often paired together. The 217s are on their way out and no longer have any booked work. That didn’t seem to make much difference and five members of the class were in regular use during my visit including 217002 in the very attractive maroon and cream livery it acquired when working for the Technical Department. 217012/015/019/021 were also seen. The other loco type in common use is the Soviet built class 233, normally used singly. One of the similar class 232s was also seen. 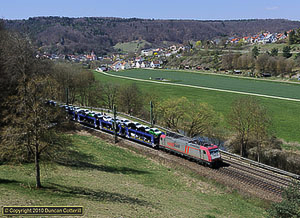 A significant number of trains run with additional locomotives at the front or rear, either to work heavy trains over the rolling profile of the Burghausen branch or simply to get engines over the line without taking up a valuable path. Mühldorf also has an allocation of class 294s, used mostly for shunting work or trip freights. The Mühldorf - Freilassing - Wiederting rubbish train, booked for a single class 225, was also being worked by a 294 during my visit with a pair being seen on one occasion. This may have been due to the 225s being required to work additional trains to Freilassing. Recent rumours that DBS would introduce class 66 or 77 diesels into the area have so far come to nothing but the old class 217s, dating back to 1965, and the class 225s, only slightly younger, can’t go on for ever. With freight traffic expected to increase in the next few years and most of the existing fleet over 40 years old and flagging, something has to change. Hopefully it won’t involve class 66, 77, the hideous Voith Maxima or the appalling GE class 70 recently introduced by Freightliner in the UK. It seems that Siemens are the only company producing a reasonable looking diesel loco these days. The “Hercules” isn’t my all time favourite design but at least it looks like a design, not an accident. Freight trains can be difficult to photograph. For a start, they tend to run more erratically than passenger trains and there’s usually less information available about when they should run. It was reassuring to find that the diagrams published on www.v160.de provided a good basis on which to plan the day’s activities. There were no-shows, additionals, early birds and late runners but most trains turned up within 30 minutes or so of their booked time. The binliners seemed to be particularly reliable, something I really appreciated when making a long trip down to a spot on the Freilassing line for what I assumed was the day’s only freight. It’s good to be able to go for one-off workings with some confidence that you won’t end up waiting for hours for a train that’s already gone. Without that confidence, the temptation is to stick to the busiest sections of line and miss out on some excellent locations. Many of the best locations are on the Burghausen line, which fortunately also sees the most freight traffic. For those with limited time, an afternoon around Tüssling, the first station out of Mühldorf and the junction of the Burghausen and Freilassing lines, takes a lot of beating. There are semaphore signals and signalboxes at both ends of the station and trains can be photographed emerging from woodland just north of the station, adding to the variety. Farm tracks and open fields on the west side of the line make access easy, even for those arriving by train. There are also nice spots reasonably close to Kastl and Altötting stations although those between Burgkirchen and Burghausen are more remote and best accessed by car. For those wishing to photograph the 218 worked passenger trains, things are a bit more difficult. I haven’t yet found any really good locations on the München line, although there are a few acceptable spots between Dorfen and Schwindegg. An open field west of Ampfing that looked fairly promising is now a motorway construction site. There are a few loco hauled passengers and freights on the Landshut line but they don’t pass the locations I’m aware of at particularly good times for the light. The Freilassing line is a bit more promising but most of the potential locations are a long way south of Mühldorf and I didn’t get round to checking them out. My one and only visit to the Passau line resulted in finding a reasonable location for the Saturdays only RE27005 just east of Eggenfelden. 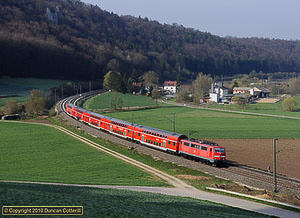 I spent most of Saturday 24 April 2010 on the electrified, double-track München - Salzburg line, east of Traunstein. This is one of the main international routes between Germany and Austria and carries heavy freight and passenger traffic. My visit co-incided with engineering work between Rosenheim and Traunstein so the traffic levels seen may not be typical. The Traunstein - Freilassing line carries a good variety of passenger trains. Local passenger services between München and Salzburg are provided by class 111 worked push-pull sets, many of them double-deckers, with the loco at the Salzburg end. These run hourly but due to the engineering work that was in progress at the time alternate local trains from Salzburg were being turned round at Traunstein with the unfortunate passengers bussed on to Rosenheim. Long distance services fall broadly into three categories. 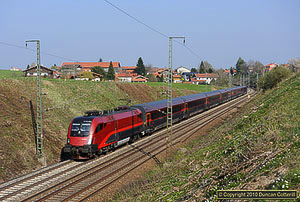 EuroCity trains from beyond München to points in Austria other than Wien, such as Klagenfurt or Graz are worked by class 101 locos on push-pull sets of DB InterCity stock and run every two hours. The loco was always at the Salzburg end of the trains that I saw. Train IC2083 from Hamburg to Berchtesgaden was formed similarly. ÖBB Railjet sets work the two hourly München - Wien - Budapest services. These are push-pull sets with a class 1116 loco coupled at the München end of the train and a similarly styled driving trailer at the other end. The third group of services are unusual in that they are internal Austrian services that run through Germany without stopping. Known as Korridorzüge (corridor trains), these services run every two hours from Wien to Innsbrück and Bregenz via Salzburg, Rosenheim and Kufstein, avoiding the slower but more scenic route via Schwarzach-St.Veit. They are formed of hauled stock and hauled by class 1016 or 1116 electrics, usually in pairs. Why these trains need a staggering 16000 horsepower is unclear. Although it was a Saturday and some of the freight that normally travelled over the line was probably diverted to other routes, there were a few freights worked by class 151 and 152 locos. I’d tried to find some decent locations west of Rosenheim a few years ago but failed miserably. This visit to the section east of Traunstein was much more productive with several pleasant locations found. Like the line through Altmühltal, there was evidence of extensive vegetation clearance by DB, which had opened up many more photo positions. This is another area where a car is virtually essential. Only one intermediate station, Teisendorf, remains open on the 30km stretch from Traunstein to Freilassing and it’s nowhere near the locations that I found. Overall, it was a very rewarding trip. The Gäubahn wasn’t the easiest line to photograph but there were enough good spots and the 120s were a class that I hadn’t really done justice in the past. Getting 110210 on a couple of trains was a bonus. Altmühltal was superb. It’s probably the best place I’ve been in several years, in terms of the number of good locations, the volume of traffic, the variety of traction and the almost complete absence of units. Although I only spent one day on the Freilassing - Traunstein line, it also produced a few good shots. If there was a disappointment, it was at Mühldorf. The whole trip was planned around visiting Mühldorf, then replanned when it became clear that there were daytime closures on the Burghausen branch. When the trains eventually started running, the weather collapsed for a couple of days. In the end, I got some of the shots I was after but many more escaped capture. I’ll just have to try again in the future. Apart from two days at Mühldorf, the weather was remarkably good with plenty of sunshine every day and a fair number were cloudless from start to finish. For this trip I tried a different approach to booking hotels, not wanting to arrange everything too far in advance and limit my flexibility but not particularly wanting to risk finding somewhere suitable on spec. I used www.booking.com to make reservations a day or so in advance, making sure that each hotel had free internet access so I could make the next reservation.